If you have ever tried writing an A3 report before, you know how difficult it can be. 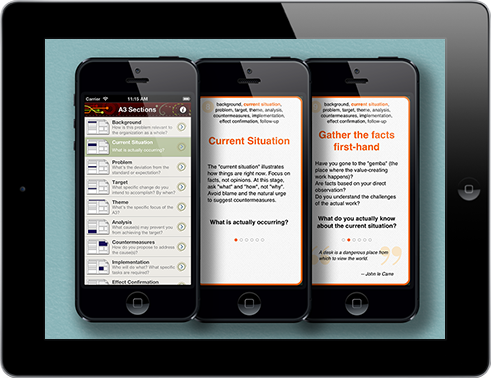 This app features 65 brainstorming cards with hundreds of questions designed to guide you in each step of the problem-solving sequence. Let’s be honest. In most organisations, people rarely take the time – or know how – to frame, analyze, and eradicate problems. A3 thinking is a wonderful approach to problem-solving and mentoring. An A3 report can be used to gain and share insights, guide and capture the story of a problem, expand the circle of influence and much more. With its focused questions, A3 Thinker will help you engage teams and co-workers in efficient problem-solving conversations. I was lucky enough to get a sneak peek of the A3 a couple of months ago and we have been using it since to improve our problem solving. The cards have become an indispensable tool in our lean toolkit. Be warned however, you get from the A3 process what you put into it. Take your time, use the cards to improve your understanding and problem solving. If you put in the effort however you will be amazed at the outputs from the process. 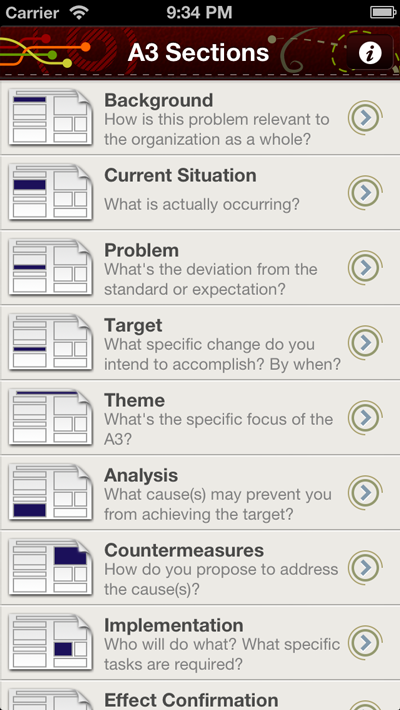 Great app for learning, practicing and brainstorming using the a3 method. Works very well and has a great interface. It follows a clear path and gives a good guidance when using a3 as problem solving method. 5 well earned stars. I downloaded this app the day it was released and I was already using it at work the following day. A3 is a Lean technique for understanding situations and problems, finding the deep root causes, identifying and validating counter-measures. A3 Thinking is a method for improving capabilities of organizations on an ongoing basis by finding the right problems to solve and solving them systematically with the help of A3. I’ve been using the A3 Thinker app in two different modes. In larger group meetings, when the goal is e.g. to grasp the current condition, identify and state the problem or do the five-whys analysis, I usually only glanced for time to time at my iPad to keep the conversation focused on the particular part of A3 that we’re working on. Before such meetings, I also flipped through the 65 cards to jog my memory. Card 19 about the problem scope was fresh in my memory during my very first meeting using this app and it saved the remaining half of the conversation. In smaller meetings (up to three people) or when working by myself, I looked at A3 Thinker more closely and reviewed the cards more often to improve the clarity of what was being added to the A3. My work this week included investigating a complex incident with A3 (so far, 22 people from five departments contributed to it) and we’re basically at a point where counter-measures are suggesting themselves. People are starting to appreciate the power of the A3 technique and the potential of the A3 Thinking method for organizational improvement. 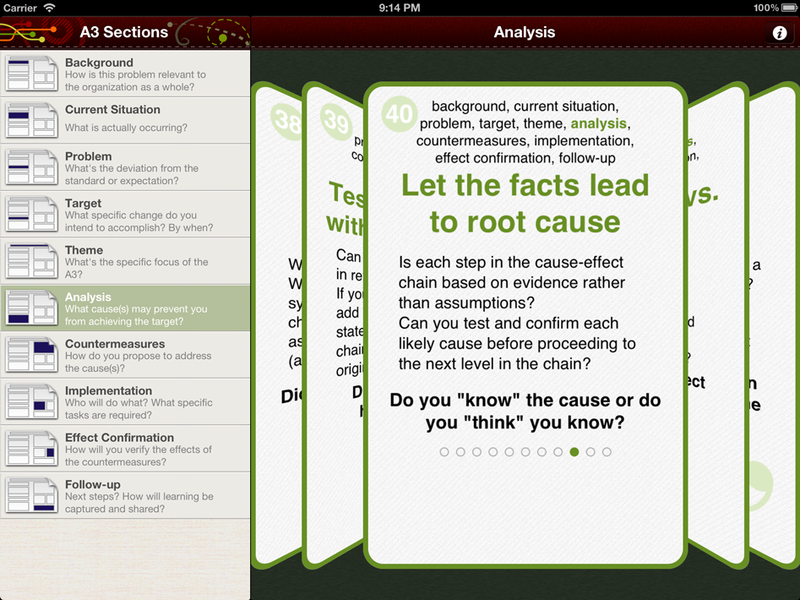 Helped by this A3 Thinker app.